Low-voltage equipment standards IEC60947 and IEC60439 currently include short-circuit ratings for products and assemblies respectively, defined in terms of the ability of the equipment to operate at a level of peak current, an RMS current for a specified time and/or a level of current conditional upon a short-circuit protective device in series. In practice the correct application of the various short-circuit ratings needs to be fully understood by the circuit designer to avoid leaving a circuit or equipment with inadequate short-circuit protection. It is also useful to take full advantage of the capability of devices and systems to avoid over-engineering, with the consequent unnecessary additional cost. This guide does not concern itself with the issue of selectivity between devices in series, which must be considered separately. The current that would flow if the short-circuit were replaced by an ideal connection of negligible impedance without any change of the supply. The maximum possible instantaneous value of the prospective (available) short-circuit current. The r.m.s. value of an integral cycle of the symmetrical a.c. component of the prospective (available) shortcircuit current at the instant of contact separation of the first pole of a switching device. The r.m.s. value of the short-circuit current which remains after the decay of the transient phenomena. An assembly will have a short-circuit rating, assigned by the manufacturer, defined in terms of the maximum prospective fault level applicable at the point it is connected into the system. This will have been determined by test and/or design calculations as specified in the assembly standard, IEC60439-1, or applicable part thereof. Summarised as: The r.m.s value of short-time current that a circuit of an assembly can carry without damage under specified test conditions, defined in terms of a current and time e.g. 20kA, 0,2s. Summarised as: The value of peak current that a circuit can withstand satisfactorily under specified test conditions. Summarised as: The value of prospective short-circuit current that a circuit, protected by a specified shortcircuit protective device (SCPD), can withstand satisfactorily for the operating time of that device, under specified test conditions. Note: the short-circuit protective device may form an integral part of the assembly or may be a separate unit.An assembly may be assigned a value of Icc alone. - An assembly may be assigned values of Icw and Ipk (but cannot be assigned a value of Icw or Ipk alone). - An assembly may be assigned values of Icw, Ipk and Icc. - An assembly may be assigned different values of Icc for different circuit protective devices and/or system voltages. - An assembly may be assigned different values of Icw for different short-time periods e.g. 0.2s, 1s, 3 s.
In terms of short-circuit capability switchgear must be considered in respect of it’s function in the particular application. A switching device is considered in two respects, self-protection and use as a short-circuit protective device (SCPD) where applicable. In this case the switching device will be short-circuit rated on a similar basis to a circuit of an assembly (see above), with a rating of Icw and/or a conditional short-circuit rating, but will in addition have a rated short-circuit making capacity Icm. Circuit breakers – the circuit-breaker will be self-protecting up to its breaking capacity rating (see later). At fault levels above the breaking capacity rating a circuit-breaker may be capable of operating with ‘back-up’ protection by an SCPD (this is in effect a conditional rating, but the term is not generally used in this context). - value (for a.c. the r.m.s. 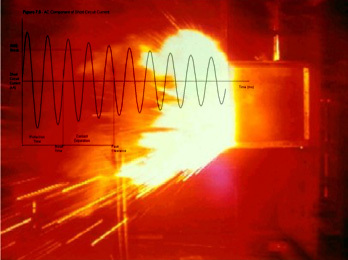 value of the a.c. component) of prospective current that a fuselink is capable of breaking at a stated voltage under prescribed conditions. Summarised as: maximum instantaneous value reached by the current during the breaking operation of a fuselink when it operates to prevent the current reaching the prospective peak. Summarised as: Integral of the square of the current over the operating time of the fuse. Sometimes referred to as ‘energy let-through’. When expressed in A²t gives the energy dissipated per ohm and thus represents the thermal effect on the circuit. Summarised as: The maximum peak prospective current that the circuit-breaker can make on to satisfactorily. Summarised as: The r.m.s prospective current that the circuit breaker is capable of breaking at a specified voltage under defined test conditions, which include one break and one make/break operations. Summarised as: The r.m.s prospective current that the circuit breaker is capable of breaking at a specified voltage under defined test conditions, which include one break and two make/break operations. The standard specifies fixed relationships to Icu of 25, 50, 75 or 100%. Summarised as: The r.m.s value of short-time current assigned by the manufacturer based on specified test conditions. Minimum values are given in the standard. A circuit-breaker can only be assigned a rated short-time withstand current Icw if it is equipped with a time-delay overcurrent release. All circuit-breakers to IEC60947-2 will have values of Icu and Ics. The maximum instantaneous value reached by the current during the breaking operation of a circuit-breaker when it operates to prevent the current reaching the prospective peak. Integral of the square of the current over the operating time of the circuit-breaker on a short-circuit. Sometimes referred to as ‘energy let-through’. When expressed in A²t gives the energy dissipated per ohm and thus represents the thermal effect on the circuit. In simple studies only the r.m.s value of steady-state short-circuit current (Ik) is quoted. The peak current is assumed to be in a standard relationship to the r.m.s current, determined by the overall power factor, and taken into account in the rating of SCPDs to the respective IEC standards. The application of short-circuit protective devices (SCPD) to circuit protection i.e. the protection of cables, is detailed in the installation rules, IEC364. In general it is accepted that selection of the protective device on the basis of thermal protection of a cable automatically provides short-circuit protection up to the breaking capacity of the SCPD, in the case of non-time-delayed devices. The prospective short-circuit current at the input to the switchboard is obtained from a system protection study. This will be given as an r.m.s value. If the switchboard has an Icw current value higher than the prospective current level then the only requirement is to limit the time for which a short-circuit could persist to within the short-time value. This is achieved by the setting of releases upstream or at the incomer to the switchboard. If the switchboard has an Icc rating higher than the prospective current level then the only requirement is to include the specified SCPD in the circuit. This may be added in the circuit upstream or may already be included as an incomer to the switchboard. If the BBT has an Icw current value higher than the prospective short circuit current level then the only requirement is to limit the time for which a short-circuit could persist to within the short-time value. This is achieved by the time-delay setting of overcurrent releases upstream. If the BBT has an Icw lower than the prospective short circuit current level Ik but has an Icc rating higher than Ik then the only requirement is to include the specified SCPD in the circuit upstream or in the end-feed unit. The suitability of any given SCPD may be derived from the cut-off current and Joule-integral characteristics by comparison with proof-test parameters. Type 1 – in which a certain amount of damage to the MCG is accepted. Type 2 – in which the MCG is capable of further use. These ratings can only be obtained by type-testing and thus the data must be obtained from the manufacturer of the SCPD or the MCG. When applied in other than domestic (household) situations the short-circuit capability of MCBs to IEC60898 is often inadequate and they need to be ‘backed-up’ by another SCPD. Details of how the appropriate SCPD is determined are given, for circuit-breakers, in Appendix A of IEC60947-2. Basically this shows that only testing of the required combination is satisfactory and thus the data must be obtained from the manufacturer of the SCPD or the MCB. The same applies to fuses used as SCPD.